The normal risks associated with soaring flight also apply to flying in wave. However, several risks are particularly pronounced in wave flying. Rotors are turbulent eddies underneath the smooth wave. Often the entire area below the laminar air flow is turbulent (“the turbulent zone”). The most severe rotors are typically underneath the crest of the primary wave. The stronger the wind and the higher the amplitude of the wave, the stronger the turbulence is likely to be. The most severe turbulence tends to be inside rotor clouds. Heavy sink and turbulence can reach all the way to the ground. – Try to identify the areas where the most severe turbulence is likely to be and stay away from those. Always stay clear of rotor clouds and keep in mind that new clouds can form very quickly (within seconds) on the upwind side of the rotor. – Ensure that belts and straps are tight before takeoff and also before returning to the rotor zone after a flight in smooth air. Canopies have been broken by pilots hitting them with their heads. – Be prepared for heavy sink in the turbulent zone and always keep save landing areas within reach, even if the sink is very strong and reaches all the way to the ground. This includes the flight path on tow! – While flying on tow, expect severe slack lines and counter immediately when slack occurs. Be prepared to release immediately if the tow plane drops out of sight, rolls over, or otherwise gets severely out of position. Wave flight often involves very high airspeeds: the lift can be so strong that the glider may still climb even when flying close to the maximum speed. And because of the crab angle required to maintain a ground track parallel to the wave, very high airspeeds may be required to make good progress relative to the terrain. When flying fast in smooth air, the biggest risk to the integrity of the plane will not be excessive g-loads but flutter. Flutter is the result of aerodynamic, elastic, and inertia forces that produce an unstable oscillation which can result in structural failure. Flutter can occur at high speeds and is a function of true airspeed (TAS) rather than indicated airspeed (IAS). This is the reason why the maximum permissible airspeed (Vne) at high altitude is far lower than Vne at ground level. A glider’s propensity to flutter also depends on the condition of the glider: damages to the control surfaces, a missing or damaged gap-seal tape along any of the control surfaces, or the addition of a paint coat can increase a glider’s inclination to flutter. 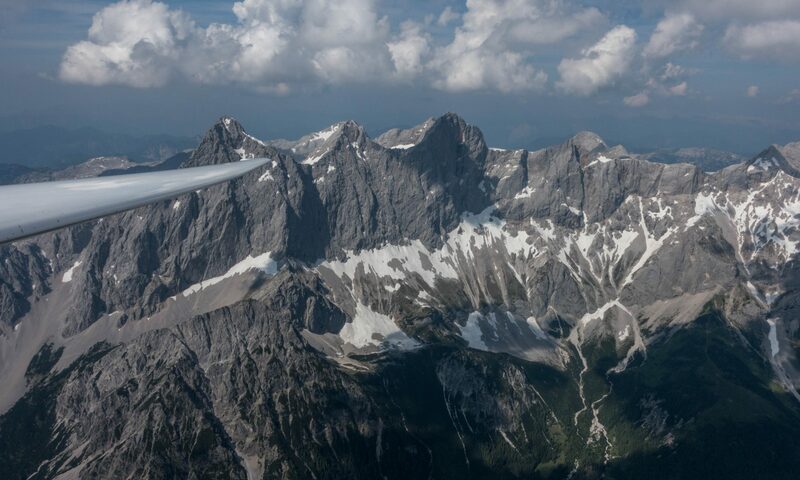 – Know the Vne of your glider at different altitudes and never exceed it. It is best to have a little placard next to the airspeed indicator that lists the permissible IAS at various flight levels. – Make sure the glider is in good condition and that any required gap seal tapes are in place and undamaged. – Use only small to modest control inputs when flying at high speeds. Our brain needs enough oxygen to function properly, which is why we have to rely on supplemental oxygen systems when we fly at high altitudes. There are regulatory requirements (e.g. in the US, pilots must use supplemental oxygen at any time above 14,000 feet or when they stay above 12,500 feet for more than 30 minutes) but it’s best to use supplemental oxygen at any time above 10,000 feet as improves clarity of thought and helps prevent fatigue. Should the oxygen system fail at high altitudes there may not be much time before hypoxia sets in and we are in serious trouble. Symptoms vary from individual to individual and can include euphoria, tunnel vision, impaired judgement, headache, dizziness, loss of physical coordination, and unconsciousness. The higher we are when the oxygen system fails, the quicker those symptoms will appear and the more severe they will be. When we no longer able to think clearly, we may not even recognize the problem until it is too late. And even if we recognize any symptoms early and take action to descend we may still pass out before we reach a safe altitude. So in essence, our life depends on the proper functioning of a simple, battery-powered system! Btw: breathing faster when the air is thin is not an option: we would exhale too much CO2 and begin to hyperventilate with similar symptoms and no better consequences. – Never fly above 14,000 feet without supplemental oxygen. It’s most likely illegal (e.g. in the US), but most of all, it is immensely stupid. If you have an oxygen system, use it at any time above 10,000 feet. – Before any flights that might lead to high altitudes, triple check that the oxygen system is working properly: make sure the tank is full, insert new batteries, and bring a spare set (make sure they are the right ones!). Test the system on the ground before you stage the glider for takeoff! – Consider using a fingertip pulse oximeter that can show your blood oxygen level during the flight. A reading below 90% would indicate a serious problem. – If anything goes wrong (the oxygen system fails, you notice any symptoms of hypoxia, or the oximeter reading drops below 90%), act now and descend immediately! Open the spoilers, trim forward, and point the glider away from any cloud. Should you briefly pass out on your descend you will have a good chance to regain control of the glider before it is too late. On average the temperature drops by 3.5 degrees F per 1,000 feet. It could be 100 degrees colder at the top of the wave window than on the ground! It might even be cold to start with as the best wave conditions are often between late fall and early spring. You can sit still in the canopy, enjoy the smooth air above the rotor zone, and not move your arms and legs because the plane basically flies itself. When you breath frost may form on the inside of the canopy. It’s already cold but now you have to open the air vent because rubbing the canopy will only damage it and the frost would reappear shortly. Hours later, when you are ready to descend, you notice your arms and legs are stiff right when you need all the flexibility and quick reactions required to deal with the rotor and possibly a lot of turbulence in the landing pattern. – It’s obvious but wear warm clothes (long underwear, gloves, hat, etc). It’s best to use multiple layers and make sure that the base layer is wicking sweat. (Wool and synthetics are good, cotton is bad.) Especially warm shoes are important because your legs and feet may be in the shade below the instrument panel where it is much colder than in the rest of the cockpit. Chemical foot warmers are great and chemical hand warmers that you can open when needed may be helpful too. – Regularly move your limbs during the flight to keep the circulation going. – Don’t forget to drink on long flights. Just because it’s cold doesn’t mean you can’t be dehydrated. Wearing sunblock is important as well, even in winter. However, be careful with sunscreen and the oxygen system: petroleum-based products can combust easily when exposed to oxygen. Wave flight can take you above rotor and lenticular clouds. It is vital to always stay clear of them. The main risks include: the cloud layer closing below; getting caught from behind in a lenticular cloud; getting enveloped by newly forming clouds; and inadvertently diving into clouds while trying to fly over them. – Always maintain visual contact with the ground that includes a glide-path to a safe landing area. Observe the development of the clouds and begin to descend early enough if you notice the gap getting smaller. – Always maintain awareness of the position and development of any lenticular clouds, especially when you fly with a crab angle into the wind and the clouds are behind you. In strong winds you may be drifting backwards into the cloud without noticing it until it is too late (instant icing of the wings and canopy, complete loss of orientation, risk of glider breaking up in high speed flight). If the air suddenly starts to look misty, speed up immediately and turn directly into the wind. – When flying near rotor clouds keep in mind that new clouds may form within seconds. Turn into the wind immediately if new bits of cloud are starting to form around you. – Be very careful during upwind transitions from one wave bar to the next if there are any clouds below: you will loose a lot of altitude during the transition and the headwind will only increase until you are upwind of the clouds. Turn around before you are over the clouds if you are not 100% certain that you have sufficient altitude to get to the upwind side. The landing pattern in wave conditions can be as unpredictable as the landing pattern in an approaching thunderstorm. The wind direction on the ground can be reverse of the direction just above it. If the rotor is directly above the airfield (not uncommon! ), the wind can change from one second to the next and heavy rotor-turbulence with roll-motions etc. can extend almost all the way to the ground. Sink rates in the pattern can exceed 1,500 feet per minute. Also: watch out for sunset! – Begin your descent on time. You might fly in bright sunshine at high altitude while the valleys below are already starting to get dark. It can take 30 minutes to descend from high altitudes. Don’t get caught in the dark! – Check ahead for the conditions on the ground while you are still high in smooth air and have multiple landing options. The conditions at your target airfield may be severe and it might be better to consider alternatives further downwind where wave and rotor are likely less extreme. Before you enter the rotor zone, check that your belts and straps are tight, and securely store any loose objects in the cockpit. – Arrive over the landing area with a solid altitude reserve. 2,000 feet AGL should be the minimum target but even that may not be enough in severe conditions. Complete the landing checklist early. Test if the air-brakes will open before you need them. – Observe the wind on the ground as you approach the pattern. If there are multiple wind socks along the runway, look at all of them. The direction of the wind may differ along the runway. – Fly the pattern with plenty of extra speed. Normal pattern speed plus half the speed of the strongest wind gusts should be the minimum. I like to fly even a bit faster. (Obviously make sure to not exceed rough-air speed.) If you encounter rolling motions, the extra speed will help you maintain control authority. If you turn into a sudden tailwind, you need the extra speed to prevent a stall. Stay close enough to the runway that you can always reach it, should you encounter 2,000 feet per minute sink.